My thanks to the folks at Literature & Latte makers of the amazing content generation tool Scrivener for sponsoring the series of content we’ll be running on improving your writing workflow filled with tips & tools we recommend. 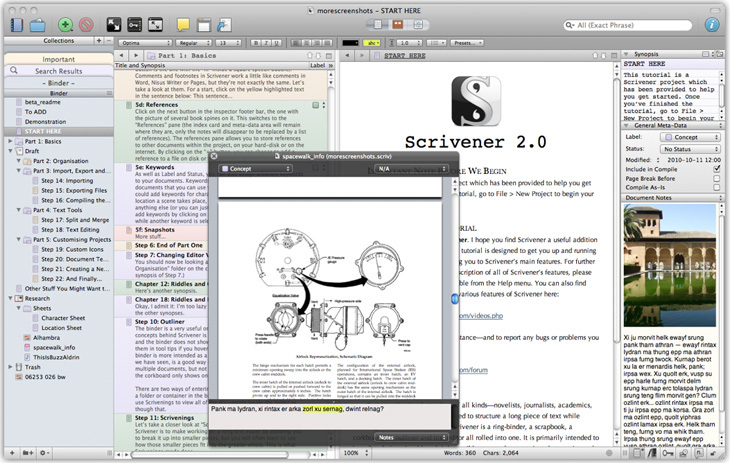 Scrivener has been one of my go to apps for outlining, editing, and writing on either OS X or Windows and we’re proud to have them as a sponsor. Try out Scrivener today! I wanted to round up of some of the best writing tools available for Mac OS X. Looking at apps, sites, and tools you can use to help improve your writing workflow on your mac whether it’s for a website, book, schoolwork and so on. These tools help you stay focused & provide the utilities to get the jobs done in their own unique interface & feature sets. There is a lot of good writing software out there for the Mac. Most of the programs linked to below are direct competition forScrivener. I provide links because the writing process is different for everyone. Scrivener suits the way I write, and hopefully some others too, but if it doesn’t suit the way that you write, then you may want to check out some of the excellent software below to see if any of it fits the way you work. All of the following tools are writing apps/services that I use or have tested on my own mac for various use cases. Some of them are free while others are paid. In my opinion when it comes to tools that I use everyday to get my work done its definitely worth the investment. TextEdit is built into OS X & is basically a great notepad for mac users. If your looking to quickly take notes down & do some very basic writing then TextEdit is the tool for you. Something I constantly use for quick notes before shooting a video as its simple to open & use. 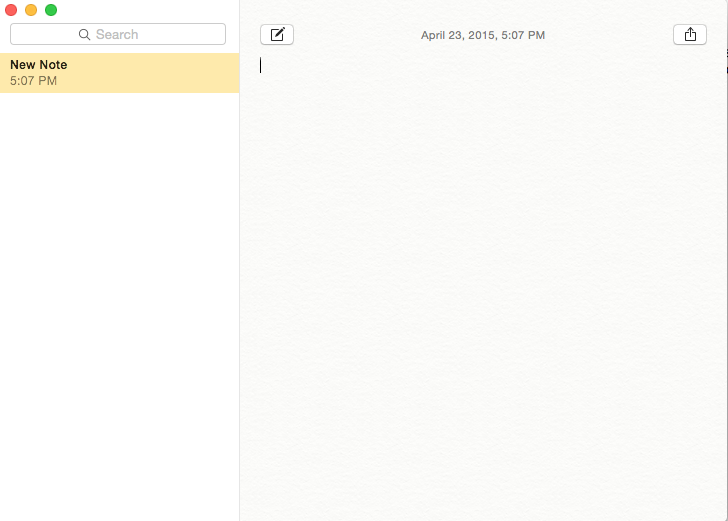 On that note…OS X also offers a dedicated notes app thats even simpler. 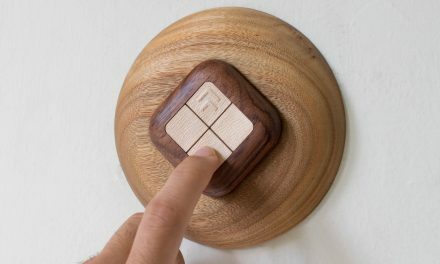 Again great for quick to-do lists or things you need to write down to remember. Something I constantly use for quick reminders that I want synced back via my iOS devices as it integrates perfectly with iCloud & your other iOS devices. Apple’s pages is the OS X equivalent to office & works well regarding basic documents. I typically use this to interact with .doc files & or to type up essays as it’s a familiar interface & offers all the basic tools to get things done. Being an Apple product it syncs together with iCloud and has a series of apps that interact well with it from Keynote to Numbers. Pages interacts with OS X in general seamlessly & provides a great basic word processing experience for users. For those of you who can’t escape the .doc files & windows based office environment than Office for Mac is for you. 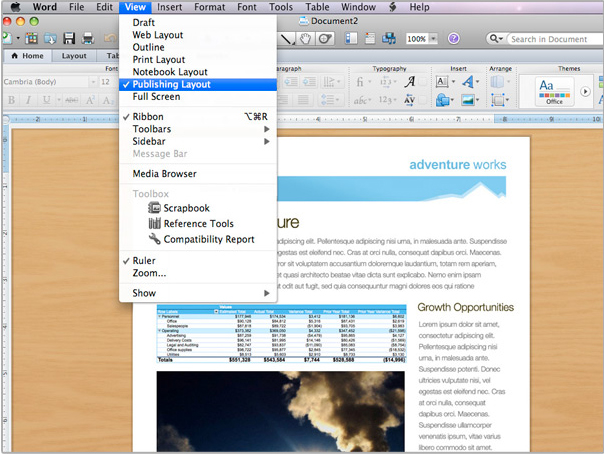 Word 2011 is the most current version for OS X and ties in with Office 365 program. For former windows users this may be the most comfortable interface. 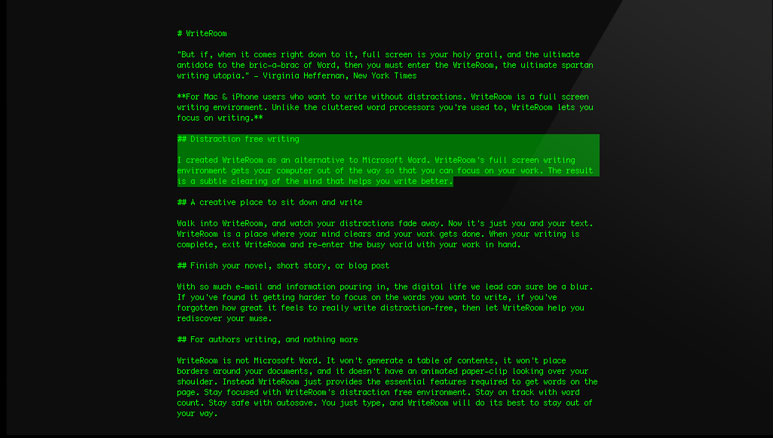 WriteRoom provides a clean and simple approach to writing. Just focus on writing & thats it. 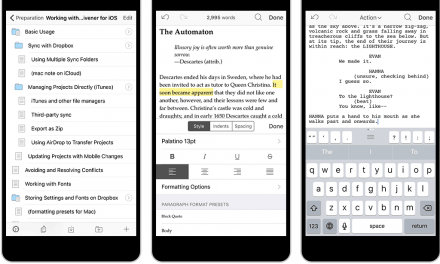 An app that offers virtually no interface & allows you create the content you want to write. Just words on the screen nothing more nothing less. A great app to use when you don’t want to be distracted by outside apps, toolbars, and formatting tools. I use WriteRoom now and again to compile first drafts of posts for my personal blog. Focusing on the writing first then working with other tools to worry about the formatting/editing afterwards. This app is geared toward developers & programmers. It’s massive support for syntax & code snippets makes it convenient to use for coders & best of all is completely free. Of course you can code in any basic text editor however this makes 10x more easier & more structured for whatever language your coding in. 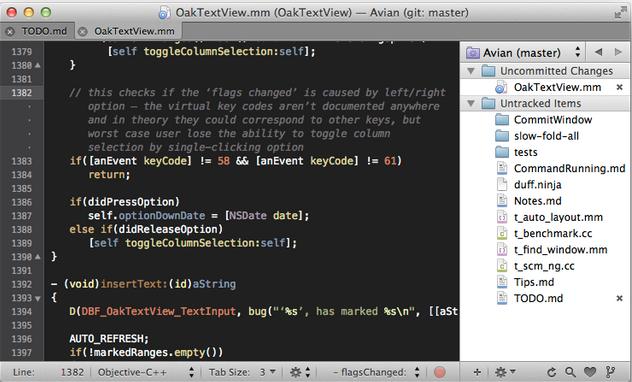 With the ability to manage multiple projects in tabs TextMate keeps your coding simple & organized. On a more advanced level Sublime Text offers a sophisticated approach to a programming text editor. Packed with features from distraction free mode, split editing, cross platform and more. Definitely the premium programming editor for OS X. 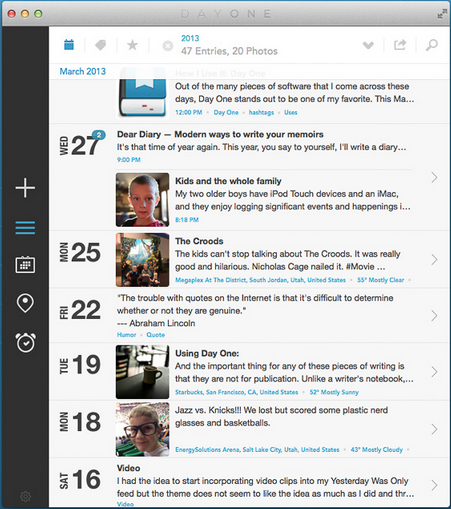 One of my favorite apps for journaling has been DayOne. I’ve found myself recently recording thoughts & writing small blurbs for my own personal archive. Things that don’t get published to the web just privately cataloged for me. Gathering my thoughts in a beautiful interface that displays your life logged over time in a brilliant way. Whether its a quick post or full on essay DayOne can support it. The great thing about DayOne is aside from the desktop app it has support for both iPad & iPhone. Aside from making this content possible the folks at Literature & Latte have developed an amazing all in one editor that is Scrivener. 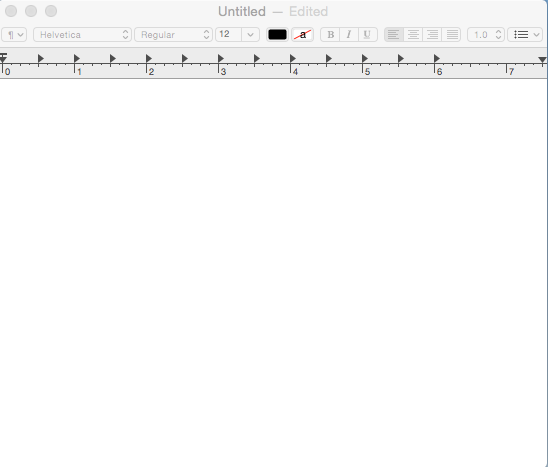 Scrivener provides an amazing interface that’s useful for just about anything. Be it script writing, writing a book, or what have you. The great thing about Scrivener is that it has a whole organizational set of features for writers allowing you to structure, revise, and organize your thoughts in one application. What I find best about Scrivener is its studio based interface that makes it easy to access everything I need without constantly having to switch from one app to another. Simply the best and most advanced software for writers. All that said keep in mind while there are a ton of text editors out there you don’t have to just settle for one. Rather you can use each to your advantage depending on your usage & needs. Be sure to keep up with the series of content we’ll be publishing regarding writing & other tips to improving your writing experience & workflow.